Movie Review: Cambodian filmmaker Rithy Panh exposes once again the atrocities and terrifying atmosphere imposed by the authoritarian communist regime Khmer Rouge, led by Pol Pot, between 1975 and 1979 in Cambodia. Looking in vain for a missing photograph taken in that time by Khmer Rouge, evincing mass murder, Panh resolves to narrate his own story, at the same time that recreates in an artsy way – through scenarios composed by clay dolls and the use of new and old footage - the impure and corrupt environment of Phnom Penh, where poor common people, capitalists, and intellectuals were eradicated and destroyed. The film starts with a big close-up of Panh’s hands carving clay to shape a little figure that symbolizes his father, a dignified man who starved to death as protest against the inhuman conditions lived in those killing fields. The scene then shifts to footage where we can see children submitted to forced labor, sick people who lost their dignitiy, and deep misery in every sense. The creative scenarios mingled with harrowing images of a sad reality, left me with an unexplainable sensation – almost like hypnotized by the narrator’s melancholic voice, absorbed by Panh’s beautiful creativity, and furious with what these innocent people had to suffer. 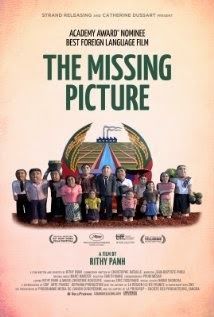 Not so blunt or striking as the ‘Indonesian’ “The Act of Killing”, “The Missing Picture” shows personal sensibility and grief. Rithy Panh showed to be confident behind the camera and his panning shots prove what he wanted to: ‘a picture can be stolen but a thought cannot’.